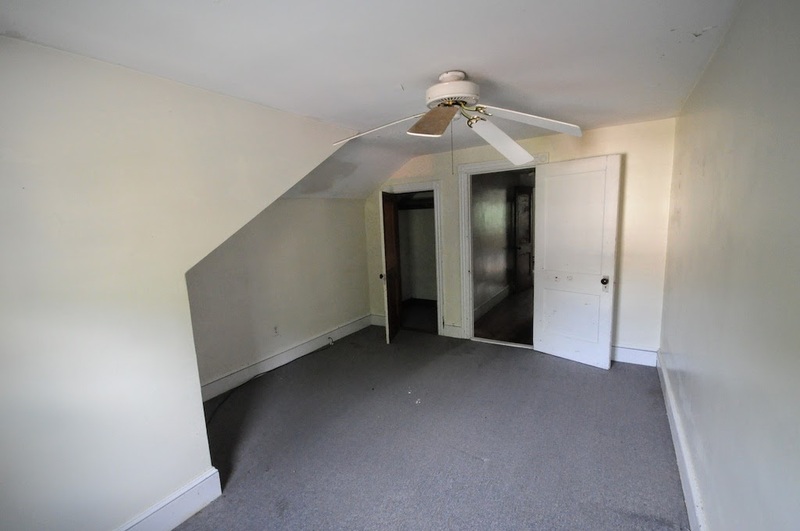 So here's what the rest of the duplex looks like! 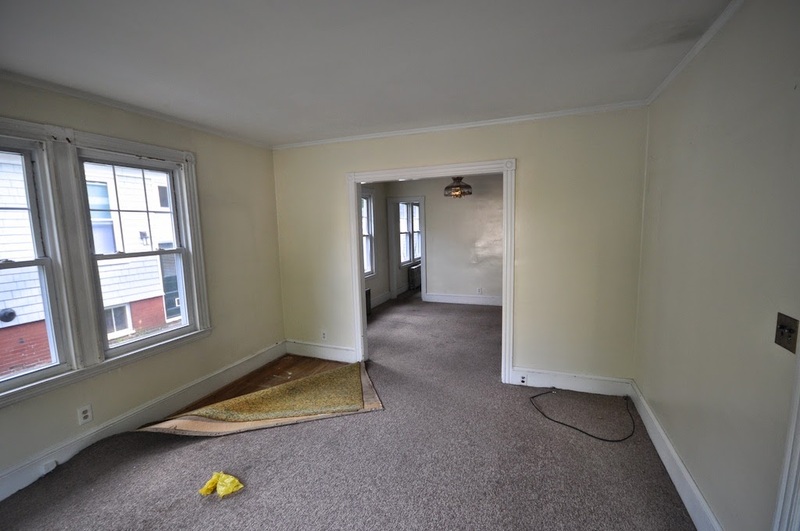 The Owners Unit has a lot of space - 4 bedrooms and 2 full baths. 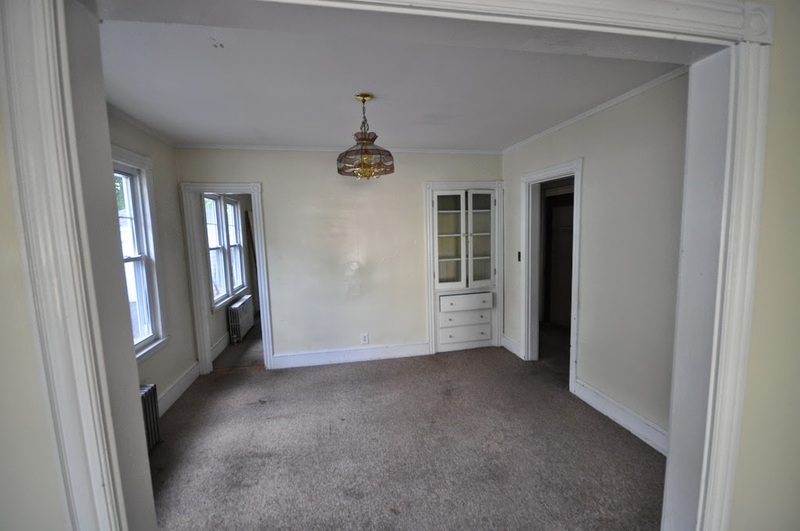 And like the Tenants Unit, we're trying to figure out how to best utilize the space. The floor plan of the first floor is a mirror image to the unit next door, but there are some key differences upstairs. 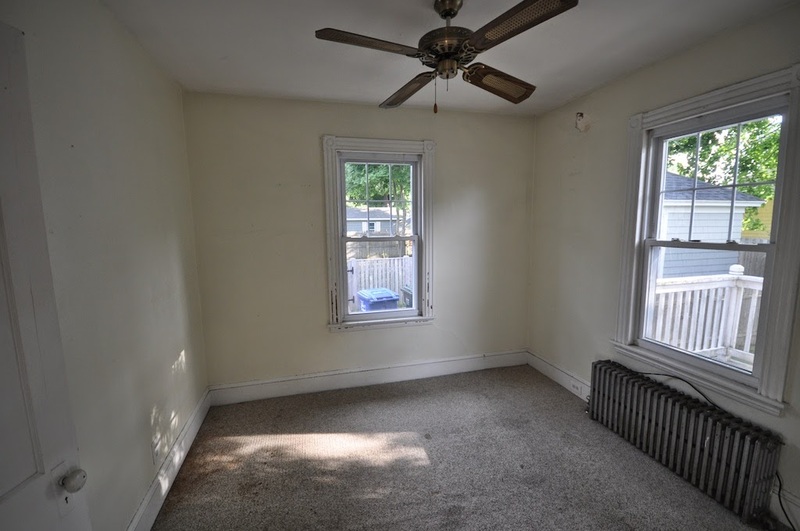 Good sized rooms with lots of light. 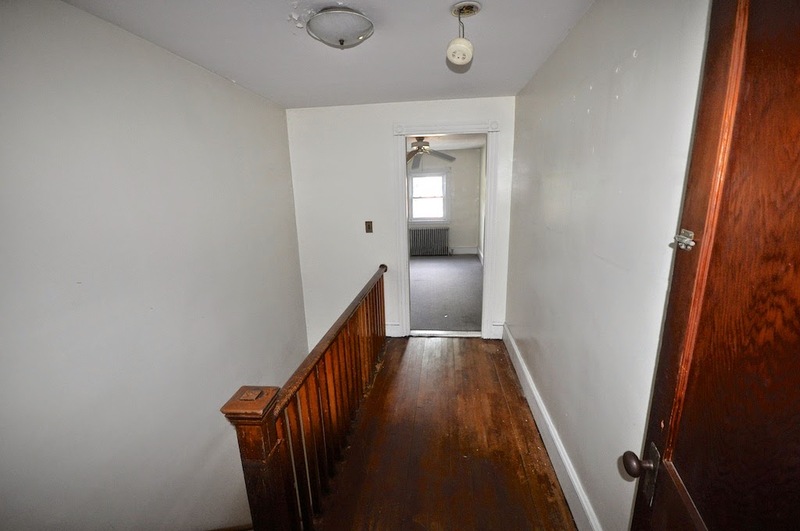 Oh, and we have beautiful hardwood floors hidden under all that old carpeting! I really love the built ins, there is one in the Dining Room and the other is in the Back Hallway. Kitchen - hmmmm......I guess I'll be dragging out the wallpaper steamer! 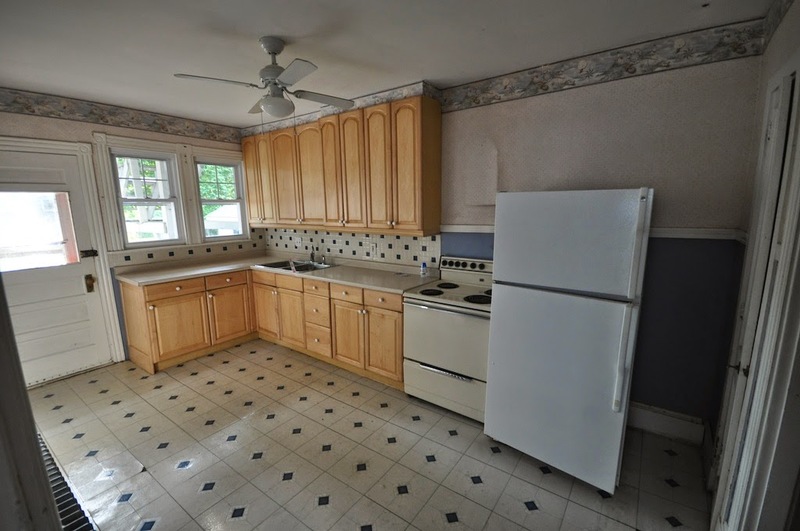 And the maple cabinets are nice, but I'm trying to figure out how to add a dishwasher. In this unit - like the one next door, we also have 2 small bedrooms on the first floor. And we have a dark bathroom on the 1st floor. My plumber keeps reminding me that we'll need to keep this same footprint for the fixtures. There isn't enough space to move things around! 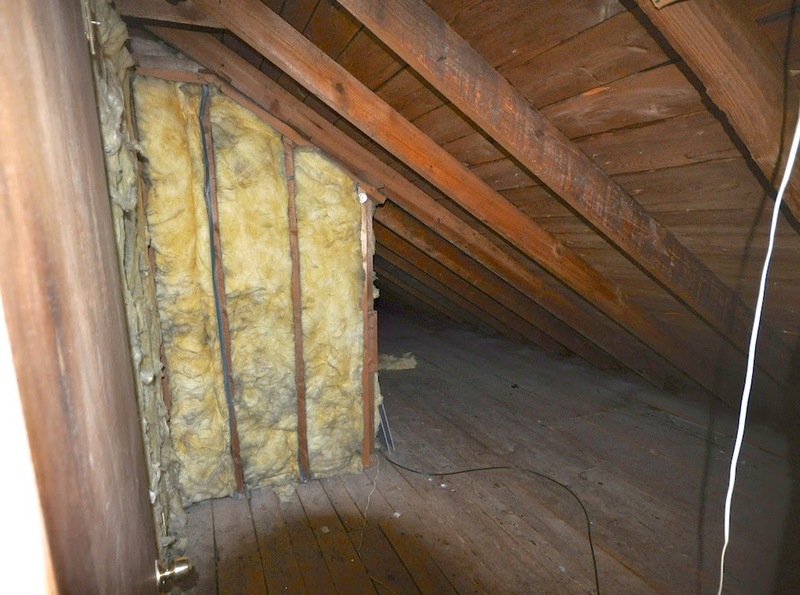 Upstairs, there is a lot of space! 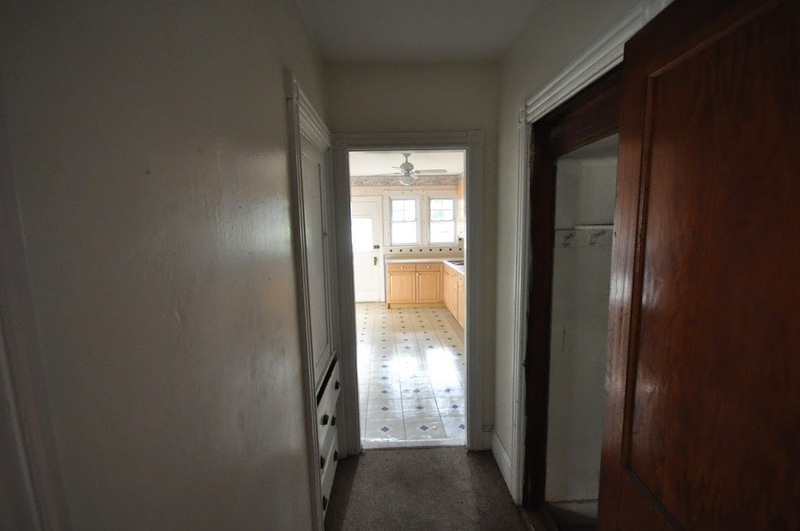 The long hallway connects two large bedrooms. The front bedroom is a nice room with a large closet. But that ceiling fan makes me laugh every time I see it! 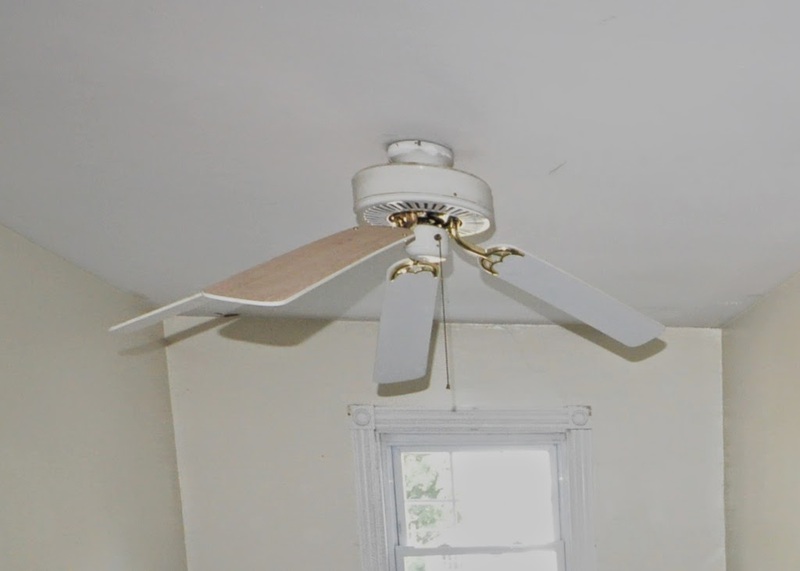 Isn't that the saddest fan you've ever seen? I think the one in the garage was nicer! 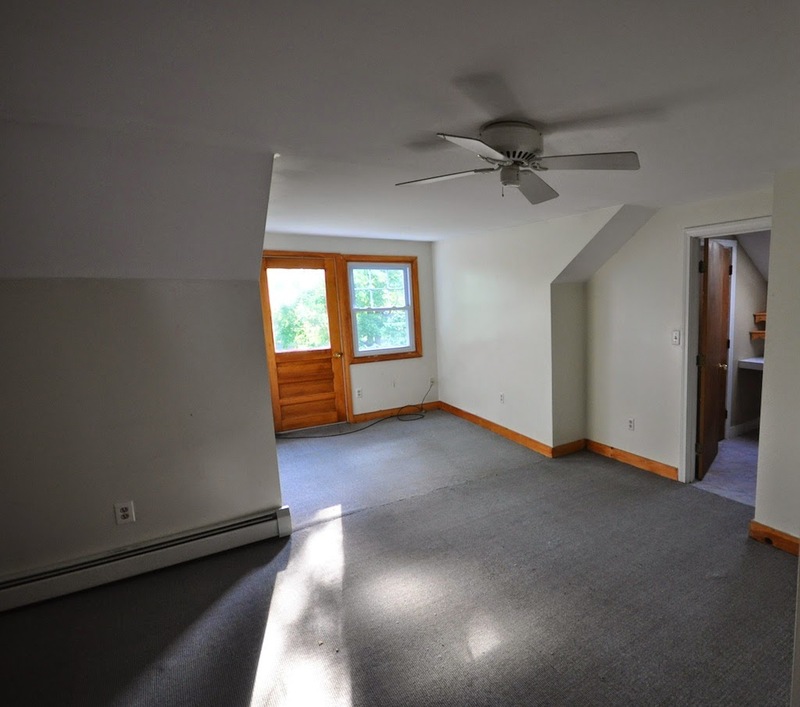 At the other end of the hallway, we have a large Master Bedroom with its own Master Bath. It also has a door to the back stairway (you know, the one to nowhere, with the 6 foot last step!). And there is potential for a big walk in closet, we just need to build some walls! 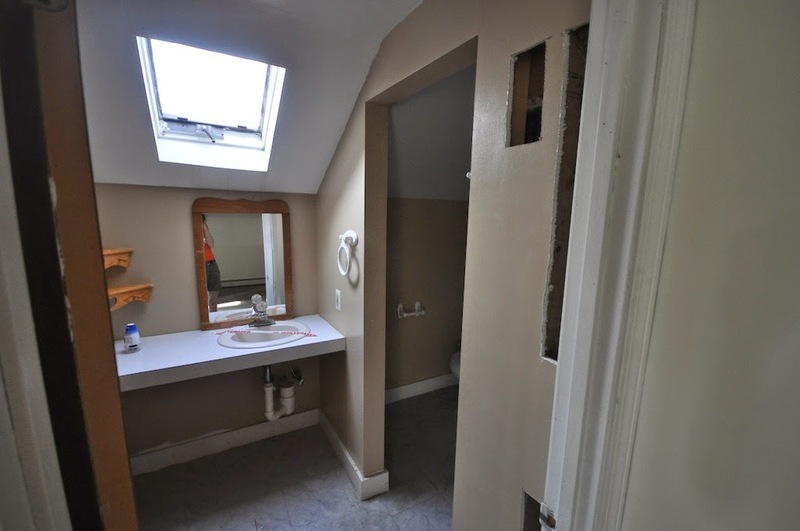 There is a master bathroom with light flooding through the skylight (which appears to leak, as evidenced by the brown paper towels wedged in the corners). See the holes in the bathroom drywall? We have a feeling someone was looking for leaks. We haven't gotten brave enough to turn on the water yet! That promises to be exciting! 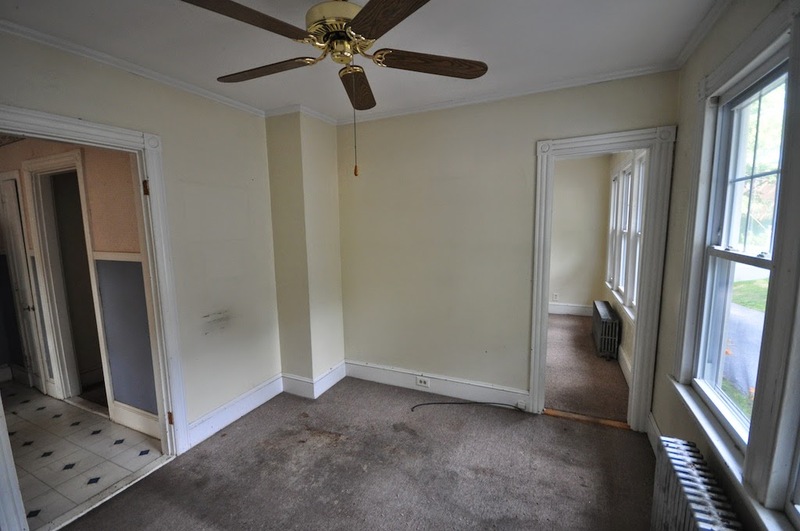 Like the Tenants Unit, the City has one less bedroom on the books than we have in this unit. So again, I'm grappling with whether to stay with a 4 bedroom unit, or match the city records and have 3. 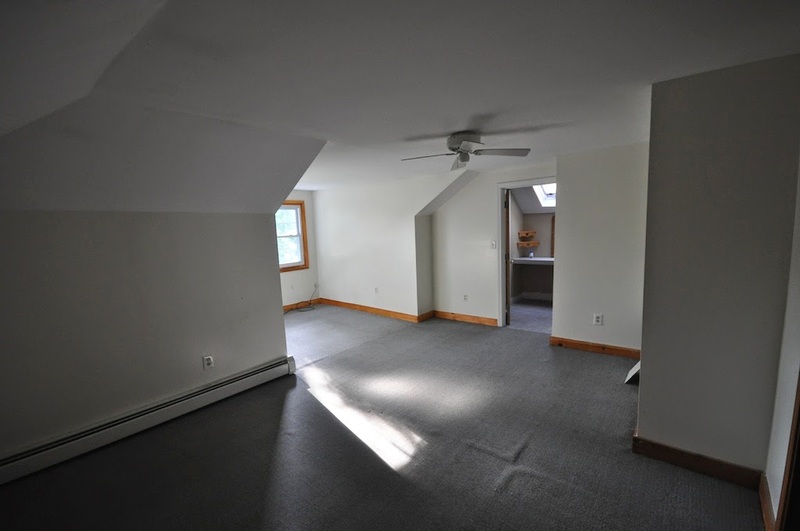 It's a big unit, but it might be nice to have more living space on the first floor. Stay tuned as we finalize the floor plans! You seem to have some extra space on the other side of the fridge. Move it over, remove a section of cabinet and voila, dishwasher space. 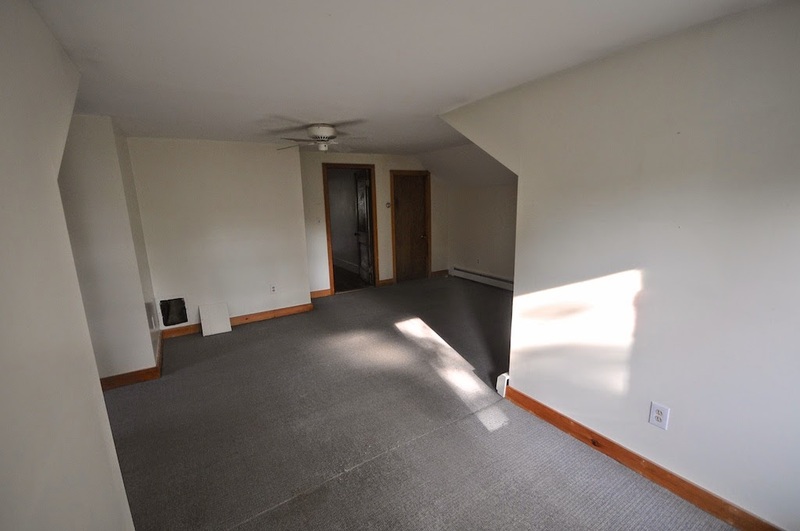 I'm pretty sure that space is the door to the basement??? It's actually a door to a weird little closet - roughly a foot square. Not quite sure what you could fit in such a tiny space. Maybe a mop and a bucket? It seems to have lots of potential. I agree about opening up the living space on the first floor....people like space to entertain! There sure are lots of interesting angles. Can't wait to see the plans. What a project! Maybe it is because I abhor spaces with no natural light, but I'd like to make a suggestion :) Would it be possible to add a small/transom window to the first floor bathrooms? 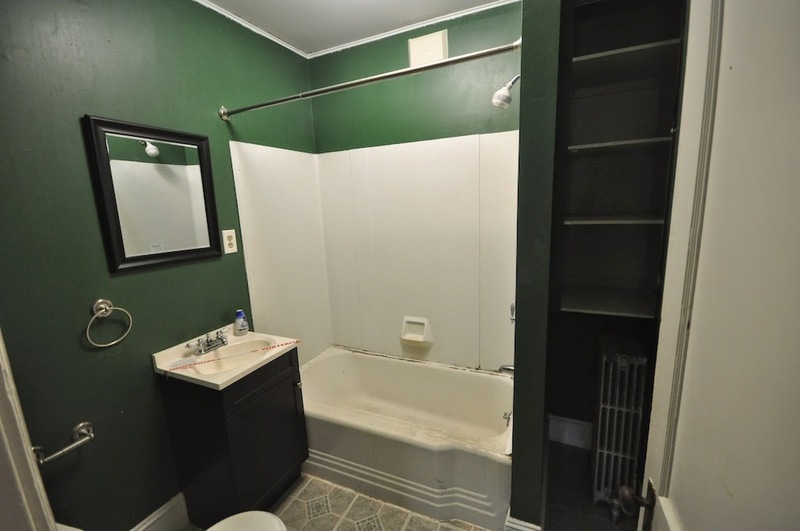 Something like this: http://bit.ly/1qgEntf (I'm assuming the shower stall is on the exterior wall). That way you'd get at least some nature light, and it shouldn't be an exterior oddity because of the enclosed foyer... Just a thought! Can't wait to see the "after" pics for this project! What a cool idea! We are tearing out the existing windows (of course the shower stalls covered them anyway). But maybe a transom window would work!